Andrea Belotti ... that famous Italian singer guy? Nope, that’s Andrea Bocelli, but good try. Andrea Belotti is a name you probably wouldn’t recognize unless you’re a fan of Italy’s Serie A or plugged into European football trade rumors, but the naughty Italian soccer man—who plays for Torino, scores goals in all manner of ways, was called up to Italy’s national team last year, and has been linked to just about every major club in the world—is a Guy To Know. Belotti is in the middle of his second stellar season with Torino. He finished 2015-16 with 12 goals, placing him among the league’s top-15 scorers. Halfway through this season, the 23-year-old has already netted 19 goals, which ties him for first atop the league with superstars Gonzalo Higuain of Juventus and AS Roma’s Edin Dzeko. If Belotti hadn’t smacked this penalty shot off the crossbar earlier in the second half, he could’ve finished the game with a hat trick and sole possession of Serie A’s leading scorer designation. Belotti’s already earned comparisons to Andriy Shevchenko, the legendary Ukranian 2004 Ballon d’Or winner. In December, Gennaro Gattuso (Belotti’s coach during his stint at Palermo) said that “people laughed” when he said the young striker reminded him of Shevchenko. 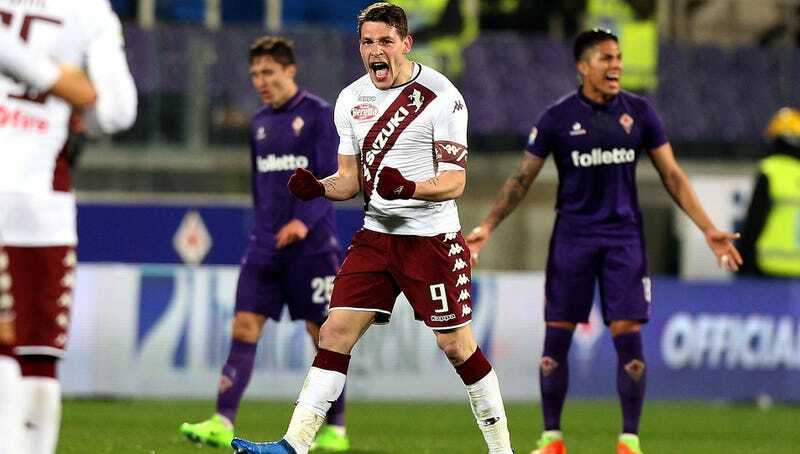 Late last year, Belotti extended his contract with Torino through 2021 and agreed to a €100 million buyout clause. Even so, the biggest clubs in the world—Real Madrid, Bayern Munich, Chelsea, Arsenal, Paris Saint Germain, etc.—have reportedly expressed interest in shelling out for the growing star. Trade rumors are just that, but Belotti’s on a tear, and if he keeps it up, you can be certain everyone will know his name come summer.